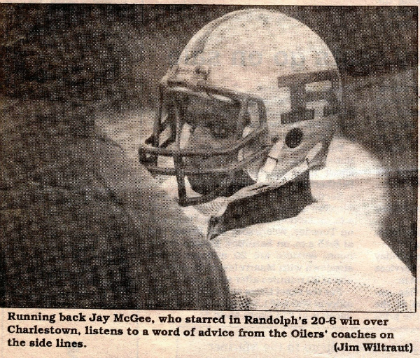 From his time as a standout running back at Brockton High School to his 14 years spent with the Randolph Oilers of the Eastern Football League, Jay McGee’s football career has brought him many memorable moments. The moment awaiting him Friday night, however, may be the best. McGee will be in Bloomingdale, Ill., where he will join the likes of Johnny Unitas and Vince Lombardi when he is inducted into the semipro wing of the American Football Association Hall of Fame. Playing for the Boxers in the early Eighties, McGee was team MVP his junior year in 1981 and started in all three Super Bowls for Brockton. McGee was a three-time Enterprise all-scholastic after leading the state in Div. 1 scoring in 1980 and 1981, amassing 170 points and 1,300 yards rushing in his senior year after rushing for 1,620 yards and scoring 31 touchdowns his junior year to earn induction into the Brockton High School Hall of Fame in 1998. After graduating in 1982, McGee received a scholarship to play football at the University of Hawaii. He returned home to attend Massasoit Community College and Mass. Bay Community College, but was a sophomore tailback for the Rainbows in 1985. 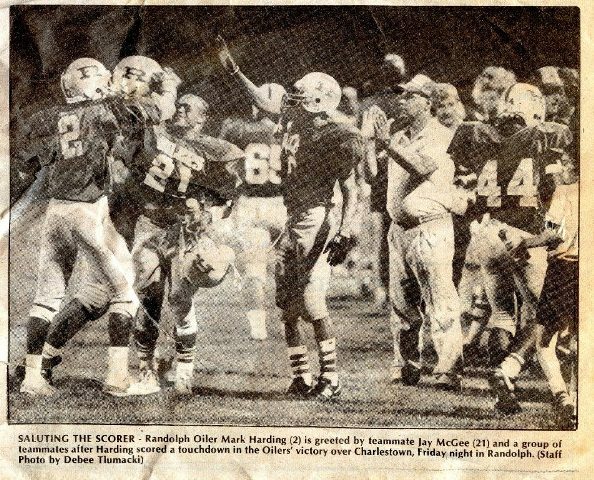 When he returned to the mainland in 1986, McGee discovered semi-pro football. “No one was ever better at playing his position than Jay McGee,” said O’Kane, who nominated McGee for induction into the AFA Hall of Fame. “He could do everything. He was a phenomenal blocker. He could run inside, he could run outside. Long-time friend Mimi DiGiammo witnessed McGee’s impressive career first-hand. For DiGiammo, there’s no difference between the McGee she watched on the field, and the one she has called a friend for 30 years. 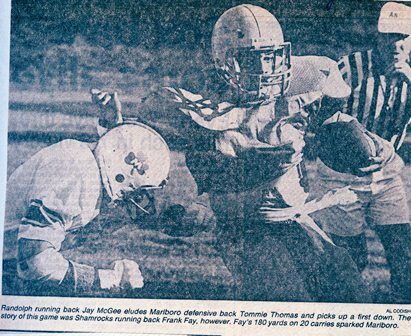 “Off the field, Jay McGee is a humble, honest, hard-working man who remains a respectable citizen and lives a quiet, low-key life,” said DiGiammo. 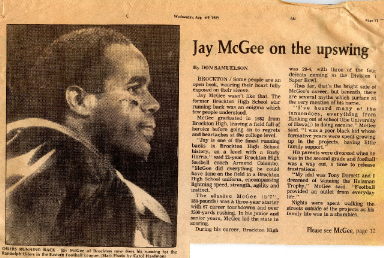 “Jay is a football icon in Brockton, right up there with Ken MacAfee Jr, Rich Miano, Rudy Harris, and Armond Colombo. Wearing the same No. 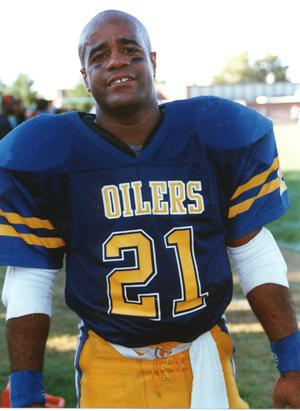 21 with the Oilers as he did with the Boxers, McGee set the standing record for all-time rushing yards in the EFL with more than 2,000, leading Randolph to a league championship in 1990 and leading the league in fumble recoveries in 1996 while never missing a single game. Now 45, McGee looks back on his days in the EFL with fondness. McGee now works for Hytex, a textile manufacturer in Randolph, and still attends games and helps out whenever he can with his former team. While it’s been almost a decade since he has played in the EFL, McGee says he has definitely seen some changes in the league. That love of football is what has brought McGee to Bloomingdale, a city just west of Chicago. 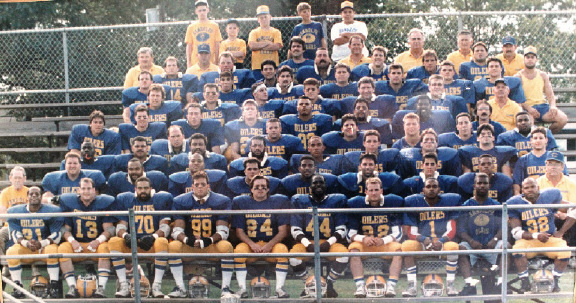 Even though McGee’s football career has spanned the U.S., he just can’t help but feel some jitters leading up to the big induction ceremony as one of 16 semipro football players going in. McGee is glad that Skip will be going with him. Last Saturday Night, April 29th 2017, a group of classmates had the honor to attend the induction ceremony into the BHS Athletic Hall of Fame. The event was held at the Massasoit Conference Center where 11 BHS Alumni (9 Athletes & 2 Citizens) were inducted into the Hall of Fame. Our classmate Mimi Uhlman was the deserving recipient of this prestigious award! 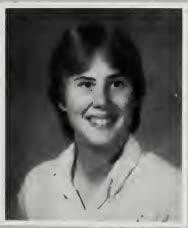 Mary Uhlman was a unique athlete for Brockton High. During her tenure at BHS she played 4 different sports at Varsity level. She accomplished this by playing varsity volleyball in the fall of her freshmen year, after which she switched to soccer in the fall of her sophomore year while playing varsity level in basketball and softball. In Mimi’s senior year she was a co-captain of the soccer, basketball and softball teams. When was the last time you met an athlete with those credentials? Back in the early 1980’s when Mimi Uhlman was a student-athlete; Brockton High participated in the Suburban League, arguably the most competitive league in the state. That being said, Mimi was a 2-time League All-star in both soccer and softball. In her senior year she was the Suburban League batting champion with a .480 batting average while leading the Boxers to the State Championship. Phil Fortin, Mimi’s soccer coach, said she was very bright (graduating in the top 10% of her class), understood the concepts of the game, was dependable, tough and a great leader. What coach could have asked for more? After graduation, Mimi Uhlman went on to play semi-pro slow-pitch softball well enough to be inducted into their Hall of Fame in 2009. She is also an accomplished golfer, playing in 2 USGA National Public Tournaments as an amateur in Illinois and Hawaii. Mimi then went to school and became a golf teaching professional. She worked at Foxboro CC and Old Scotland Links in Bridgewater just before moving to Florida to continue teaching. In addition, she drives tractor trailer rigs! Let’s just say her life has never been boring. It is a privilege to introduce to you the newest inductee to the Brockton High School Athletic Hall of Fame Class of 2017, Mary “Mimi” Uhlman. Jan (Sharkansky) Singer has blazed the trails in the Retail Industry specializing in beauty and fashion! From Chanel, to YM Magazine, Calvin Klein, Prada, Nike, Spanx and now training for her role as CEO of one of the L Brands, Victoria's Secret. This article chronicles her career after graduating from Ithaca College in 1986.